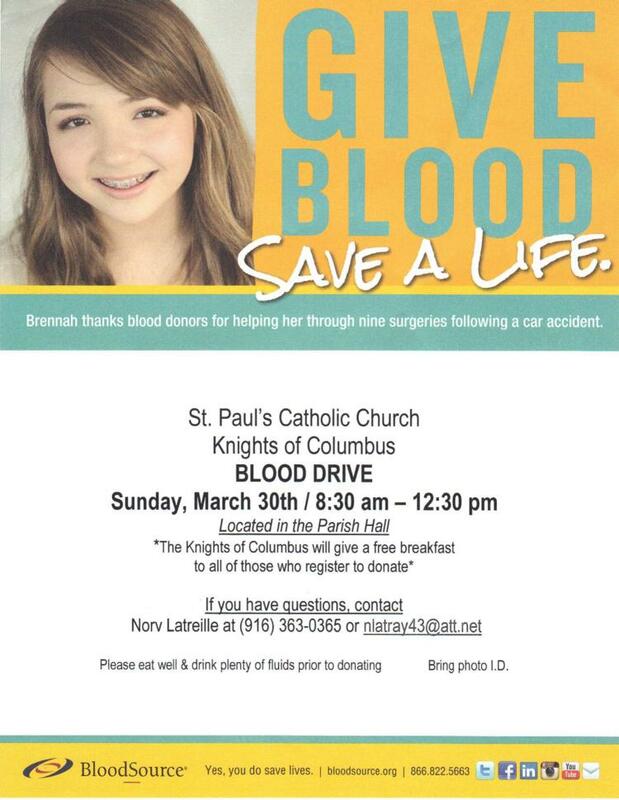 The Knights of Columbus will be sponsoring a blood drive at our parish on Sunday, March 30th from 8:30 am to 12:30 pm in the parish hall. The Knights of Columbus will give a free breakfast to all of those who register to donate. Contrary to what most people believe the vast majority of people are eligible to donate blood. Did you know that there are very few medications that will cause you to be ineligible to donate. Even if you have high blood pressure you can donate your blood as long as your blood pressure is under control with a medication. Of all the people in the country who are eligible to donate their blood only 5% do so because the rest assume they can not donate for some reason. A pint of your blood is needed to help save another persons life. Maybe some day you will need blood and if you donate now then there will always be blood available for you. So, on March 30th, please come by the parish hall and just ask the medical staff from The BloodSource if you are eligible. If you just do that the Knights will give you a free Parish breakfast just for trying. Bring along your family members also. Anyone over the age of sixteen can donate blood and receive a free breakfast. If you have questions contact Norv Latreille at 916-363-0365 or email at nlatray43@att.net. Please eat well and drink plenty of fluids prior to donating. Bring a photo I.D. with you.